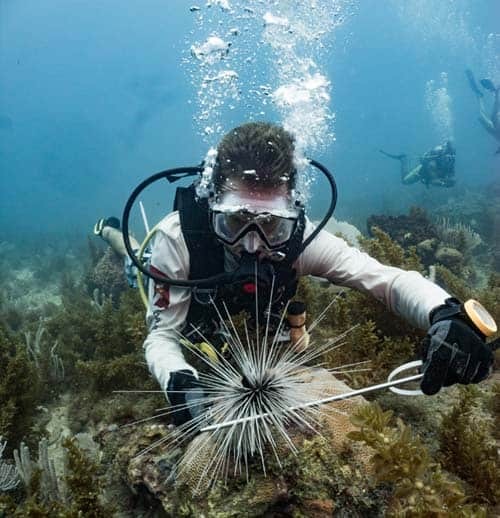 A marine biologist measures a sea urchin. Photo credit: Nicole Helgason / Shutterstock. One question that we frequently get asked by students considering a career in marine biology is whether they need to learn to SCUBA dive. Marine biologists do not have to be able to dive. Many roles are lab or office based and field work frequently involves surveys which are boat based or on the shoreline. You actually don’t even need to know how to swim! Ofcourse, it is exciting to experience being underwater close to the animals that you are studying. However, don’t worry if you wish to pursue a career in marine biology but are unable to be active in the water for some reason. There will still be plenty of options for you working both indoors and outdoors as a qualified marine biologist. One of the beauties of pursuing a career in marine biology is the diversity of roles available, as well as the interest of the subject matter itself. It’s a profession that will rarely leave you bored! What does a marine biologist actually do then? It’s difficult to describe the range of activities that a marine biologist might be involved with in one paragraph, as work can involve anything from monitoring sea turtle nesting sites on a beach to identifying tiny species of plankton under the microscope in the laboratory. Marine biology is a vast subject, and although many students choose the career in the hope of working with large charismatic animals like whales, sharks and turtles, they frequently find themselves working on something equally fascinating but a lot smaller! There is also a good deal of paperwork that goes with managing and planning marine environmental projects back in the office, and these are the type of roles that marine biologists frequently find themselves involved in as they progress further with their careers. I’ve pulled together a list of occupations and activities that marine biologists are commonly involved in below and you’ll see that only 4 of the 41 lines of work listed actually involve the biologist getting in the water! Although some survey work may involve snorkeling or SCUBA diving, many marine researchers use Remotely Operated Vehicles (ROVs) now to perform underwater surveys and there are a whole host of sampling devices that are used to collect animals and plants in the ocean. Reef surveys, eg. investigating the diversity of fish and invertebrate species on coral reefs in the tropics. Reef restoration programmes, eg. monitoring the benefits of constructing artificial reefs or planting young corals in order to boost marine biodiversity. Invasive species management, eg. spearfishing to control the invasion of non-native lionfish infesting coral reefs in the US and Caribbean Atlantic waters. Underwater film and photography, eg. capturing images (video and stills) of marine life for use in marine environmental communications and outreach. Check out the video below of some of our team members snorkeling in the southwest of Ireland. Marine mammal surveys, eg. whales, dolphins, seals and manatees. Fisheries surveys, based on research vessels or commercial fishing boats. Benthic surveys, ie. investigating animals that live on and in the seabed. Plankton surveys, sampling microscopic plant like organisms (phytoplankton) and animals (zooplankton) that live in the water column. Deep sea exploration, eg. surveys of deep sea reefs using ROV’s or submersibles operated from marine research vessels. Tracking the movement of marine animals using tags, acoustics, telemetry and photo identification. Collecting tissue samples of marine organisms for genetic studies, eg. DNA profiling and fingerprinting. Fish husbandry and aquaculture, eg rearing and farming salmon, bass, mussels etc. at sea. Intertidal surveys investigating the ecology of animals and plants living on the seashore. 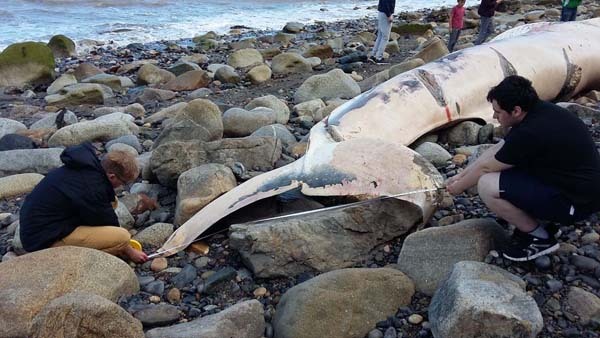 Whale, dolphin and porpoise stranding investigations. Shark and ray eggcase (mermaid’s purse) surveys. Land based whale, dolphin and porpoise surveys. Sea turtle nesting surveys including egg and hatchling counts. Coastal education and outreach, eg. seashore safaris and school tours. Marine biologists from Marine Dimensions measure a dead stranded Fin Whale on a beach in Ireland for the IWDG Stranding Programme. Photo credit: Sarah Varian/Marine Dimensions. Marine species identification and classification (taxonomy), usually involving examination of animals and/or algae under the microscope that can not be identified with the naked eye in the field, eg. microscopic plankton. Fish dissections, including investigation of age and growth, reproduction, diet and parasitology. Histology, ie. the examination of the micro-anatomy of cells, tissues and organs. Commonly used when studying the reproductive cycle of marine animals. Genetic profiling and fingerprinting, ie. extracting and examining the structure of DNA in tissue samples of marine animals in order to learn more about the characteristics of species and populations. Marine mammal necropsy, examining the possible cause of death of whales, dolphins, porpoises and seals. Fish husbandry in public aquariums, eg cleaning, feeding and caring for the marine animals. General maintenance, eg. cleaning tanks, carrying out water changes and collecting seawater, replacing and cleaning filters and air pumps. Managing, collecting and rearing new stock. Teaching marine environmental education programs in schools. Presenting scientific papers at conferences. Supervising and teaching students in colleges or universities. Engaging with the public through workshops at public events, eg. at festivals and in libraries. 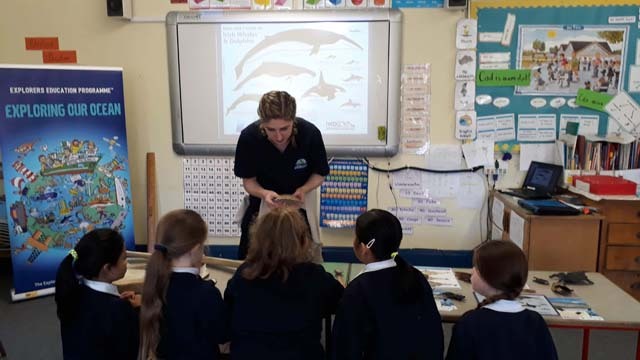 An Explorers Programme educator with Marine Dimensions teaching school children in Dublin, Ireland. Photo credit: Sarah Varian / Marine Dimensions. Writing project proposals, reports and scientific publications. Data entry, eg. entering data that has been gathered in the field into digital spreadsheets on a computer. Preparation of digital maps and Geographical Information Systems (GIS) depicting survey results. General office administration, eg filing, photocopying, all that fun stuff. Team meetings and management, networking and training. Events management, ie. planning, scheduling and coordinating workshops and courses. Preparing teaching materials and Powerpoint presentations. Marine science policy and management, eg. evaluating the quality of scientific information that informs decision making, strategies and plans in government. Health and safety, ie. ensuring that operations in the field, laboratory and office are conducted safely. There are many more activities and occupations that a marine biologist may be involved in that have not been listed here, but this list should at least give you some idea as to the type and nature of activities that typify a career in marine biology. Note that many of these activities could form part of a broader project oriented role. For example, you might be employed as a fish biologist working on a two year contract studying the biology of a particular species. As part of this project you would then be involved in boat-based field work to sample the fish population, followed by some time in the laboratory examining the anatomy of specimens that you captured. Following on from the practical phase of the project, you might then be expected to analyse the data that you gathered, eventually writing up the results of the study in the form of a report. Check out the video below of our Marine Experience workshop. It’s a really engaging event which involves several activities, including snorkeling to collect the marine animals, which are then cared for in aquaria before being released back into the wild. It also involves lots of travel to the outreach venues (early 5am starts). It’s alot of work but it’s a gig that’s guaranteed to inspire and we have SO much fun doing it! Is being a marine biologist hard? Being a marine biologist is a hugely rewarding experience. However, if you are considering marine biology as a career choice, you should be aware of the fact that it is an intensely competitive profession. There are, quite simply, too many qualified marine biologists out there for the number of positions available, so be prepared to work hard in order to be successful. This also means that you do not necessarily get to pick and choose the occupations that you’d like to be involved in. Sure, you can be involved in many programs on a voluntary basis, but if you want to be paid to work on something specific, eg. tagging sharks, you need to be very determined and at the top of your game on an ongoing basis. Marine biologists are extremely passionate about what they do, but many graduates do end up diversifying, or working jobs that are unrelated, in order to continue pursuing their passion. It’s something to consider before you make the decision to embark on the long journey involved in gaining the necessary qualifications and work experience to pursue this career. Do marine biologists have to travel a lot? Marine biologists do tend to travel quite a lot as the animals that they are studying are rarely on their doorstep. They may need to travel to survey sites, which can sometimes require a lengthy time away from home, eg. on a marine research vessel at sea. They also frequently travel to meetings and conferences abroad in order to share the results of their work with other scientists. Marine biologists who work as educators in community based outreach may also spend a lot of time on the road travelling to events around the country, eg. in schools, libraries and at festivals. The potential for travel is usually seen as an attractive option to biologists in the early stages of their career when they generally have fewer commitments in life. After all, most marine biologists love the fact that their career involves exploration and adventure! However, the long hours on the road and time away from home can put pressure on biologists later in their careers when family responsibilities tend to be greater. This is when the more secure office based roles become more attractive! Do marine biologists help animals? Many marine biologists pursue a career in marine biology in the hope of helping animals as they are generally nature lovers. By learning and understanding more about the natural world around us, we hope to get a better idea as to how to manage and predict changes in populations of animals in the sea, as well as learn more about how mankind influences life in the ocean. It’s worth noting, however, that in order to help animals, marine biologists do sometimes have to collect, preserve and examine animal samples back in the laboratory in order to learn more about the populations. This can be one of the most difficult aspects of the career for some zoologists, especially if they have made a decision to be vegan or vegetarian. If you have difficulties with this aspect, you could try to pursue projects that do not involve biological investigations. For example, movement ecology involves tracking and tagging live animals in the wild to learn more about how they migrate to spawning and feeding areas. Or you could focus on the field of marine botany, specialising in marine algae. The decision is a personal one and not all marine biologists have the same views. Some love eating seafood while others wouldn’t dream of it! Others prefer to opt for seafood that is sourced from sustainably managed fisheries. All in all, marine biologists are a pretty mixed bunch, as I guess is the case with most professions! If you would like to be kept informed about upcoming articles in our Marine Biology FAQ series, please sign up to our mailing list and we’ll keep you posted!